Tasha , My Disorganized Ramblings, has taken pity on the fact that I am seriously behind on book reviews and agreed to review my copy of Perception for me - Thanks Tasha! Description: When you can see things others can't, what do you do when someone's watching you? is that Kim Harrington writes really sweet, simple, awesome mystery/romance-y stories. is that I love how uncomplicated they are. is that they are a very enjoyable break from the emo/horrific/dystopian YA's that are popular today. is that despite having a touch of paranormal (Clare's family all have some sort of psychic power) it isn't a real paranormal. is that Clare is (again despite the psychic-ness) is a very real teenager. She has crushes on boys, she likes two of them actually! 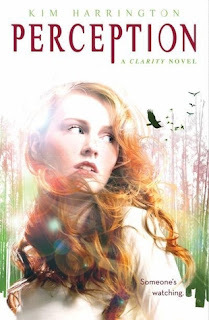 is that yes, it is a sequel to Clarity, but you could probably get away with not reading it (although my OCD nature screams at you to read them in order!!). is that it's hard to really write a review for this book - it's almost as though in it's simplicity, it is too simple and yet so much more. This is bare bones. There is no filler. I feel like every word is carefully chosen. I love how it's like the first book but different and not as crazy and the guy she picked loved it.